Mark A. Dimmitt has a Ph.D. in biology (herpetology) from the University of California at Riverside after earning an M.S. from UCLA and a B.S. from Pomona College. He worked at the Arizona-Sonora Desert Museum from 1979 to 2011, first as Curator of Botany, and eventually as Director of Natural History (field ecologist). His areas of research included botany and vertebrate biology, and he is the author of more than 50 scientific and popular publications about ecology and horticulture. He is a Fellow of the Cactus and Succulent Society of America. His major publication is the plant and ecology chapters of A Natural History of the Sonoran Desert (2000), and is the senior editor of the revised edition (2015). Mark’s other and ongoing career is as a plant breeder. He spent a couple of decades hybridizing Trichocereus (=Echinopsis, cacti), then Tillandsia (bromeliads); he has introduced about 50 cultivars. 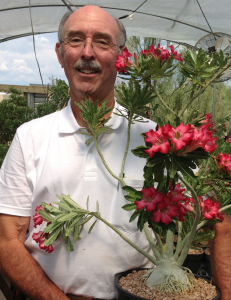 Since the late 1970s his main focus has been on hybridizing the genus Adenium; ‘Crimson Star’, ‘Evelyn Marie’, and ‘Bouquet’ are among his creations. He is coauthor of the book Adenium: Sculptural Elegance, Floral Extravagance (2008). Mark also collects and grows a number of other weird plants, mostly succulents and epiphytes.